This 10 Buck Challenge is the easiest way to donate! Simply donate $10.00 to Family Promise Rochester, and then have 5 of your friends do the same. This is one way to show how a little goes a long way when we come together for a good cause. Are you a fan of social media? 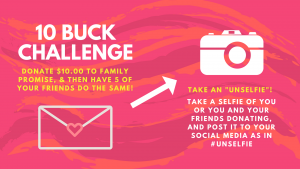 As you or you and your friends complete your donation, take a “unselfie” and post it to your social media pages, or you can send it to admin@ihngr.org, and we will post it for you!